Reading Books on the Accent! Book options will open up. Choose one to read (We chose “What Do You Do?”). They mostly focus on different core words but there are some books that are more complex (e.g., Goldilocks). If you pick the book called “I Can Turn…” (the character changes colors throughout the book), you will see the relevant vocabulary for each page (“I can”, “turn”, colors). Turn the pages by hitting the blue “prev page” and “next page” buttons on the little book page that opens up. The icons that appear are the first ones in the sequences for the vocabulary on the page. 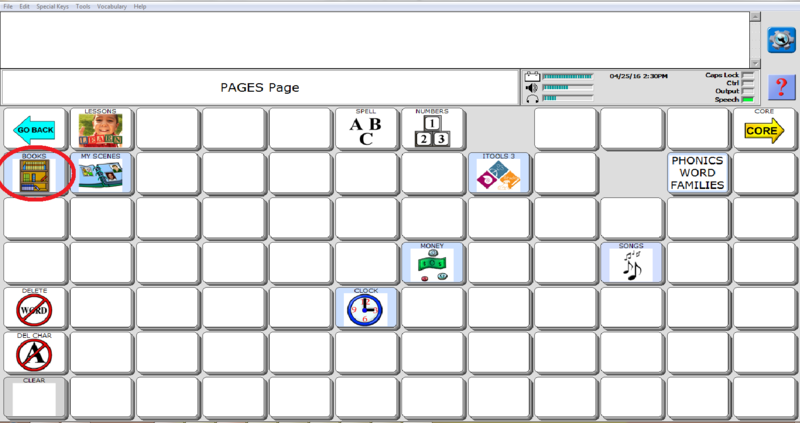 The page will move around the screen so that you can access the vocabulary. Enjoy! We have been really enjoying our journey implementing the Four-Block Model in several classrooms. As with anything new, we have discovered a few things we had to problem solve our way through. Our school has gone through a huge AAC overhaul over the last 2 years with a large number of students receiving high-tech devices in a very short amount of time. Teachers and paraprofessionals continue to adjust to the change and some are finding it difficult to model on devices. 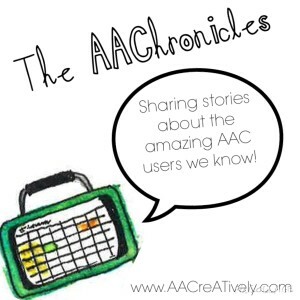 At the same time we are overhauling AAC we are also working on how we teach literacy. 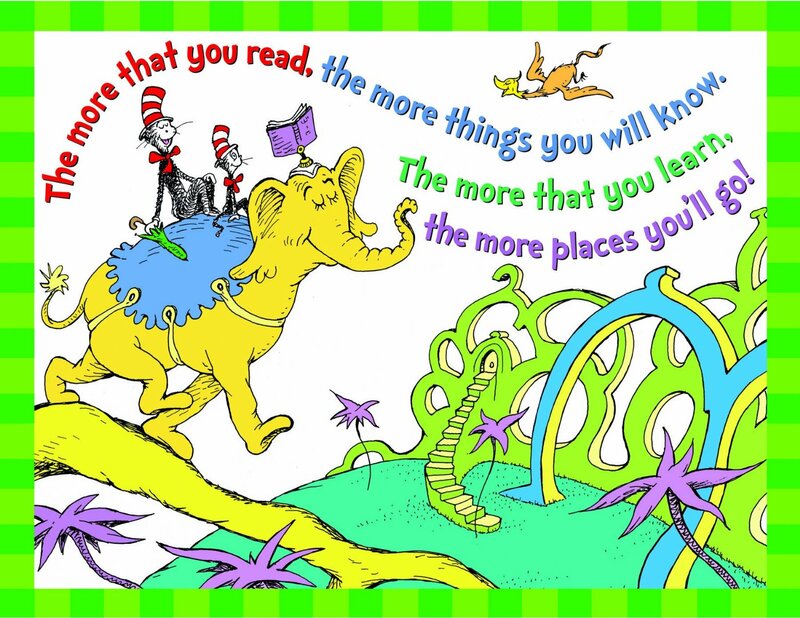 After a wonderful presentation at ATIA, we began doing shared reading lessons in several classrooms where we have early emergent readers. 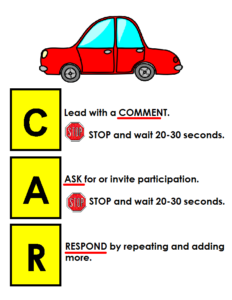 We are following a modified CAR strategy during these lessons. The teacher reads a page and models commenting about what is happening on the page. Next, they ask for or invite participation from students (this could be just pausing or asking “what do you think?”). Once a student participates, they respond by repeating what the student said and adding information. 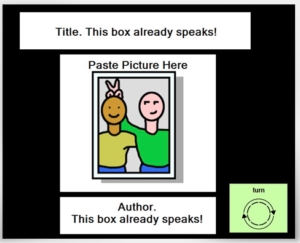 Often this requires some creativity to relate what the student has said back to the text (try working the word “bathroom” in the book “Brown Bear”). You can download the CAR visual we use here. One of our fantastic girls who is waiting for her own eye gaze device to be approved by insurance was recently working with her SLP. We’re crunched for time as she is already 19 and we’re trying to make sure she can use as many features of the device as possible before she graduates. She’s been working on reading, writing with Unity and the keyboard, and navigating out of the communication software to launch other applications and then back into her communication software. 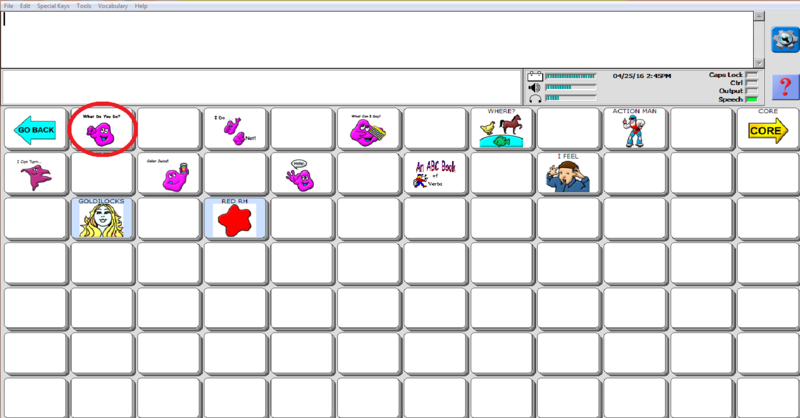 This week she had asked to play a game so her SLP helped her navigate to the LooktoLearn software. She chose “Paper, Scissors, Stone” and appeared to be having fun. 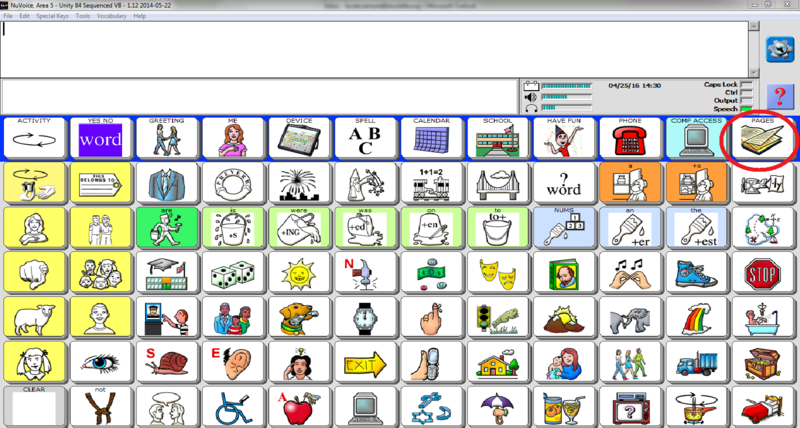 After a couple of minutes, her SLP navigated back to the NuVoice software in case the student had something to say. And she did! She said “play fun, stop talk!” It was fantastic! She’s only been using the device for a month during trial sessions and to hear her say this sentence was amazing! 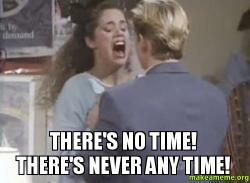 She obviously got to go back to her game! Age Respectful Fun for Older Students! I wanted to share some fun items I’ve purchased to use with some of my older students with complex communication needs. 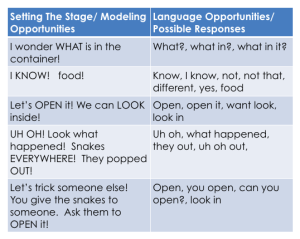 It’s sometimes challenging to come up with activity ideas for my older students using AAC but I recently decided to of the “joke” route and it’s been a blast. Some of my younger students, especially the boys, have also been getting a kick out of these items! Here are some of my favorites. If you click the pictures, they link to where you can purchase them on Amazon.com. Snakes in a Can! These are a favorite because you can use them to surprise students and then students can use them to surprise others! 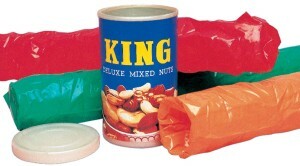 My students love “tricking” other staff and students into opening the cans. They seem to be very motivating to communicate! 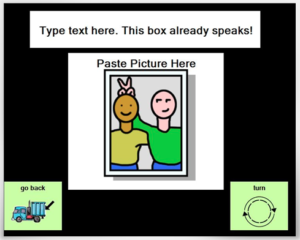 Also, for many of my students with complex bodies (physical impairments) they can participate in funny activities by giving the directions and watching the results! A couple of words can lead to a huge payoff in laughs! The NO button! The button has ten different phrases/ voices to say “no.” I’ve paired it with “No David” for younger students or taken turns with students asking questions and then saying “no.” For example, you can ask a student a question such as “do you like boogers?” and they hit the “no” button. Then the student can ask you a question so you can hit the “no” button! sounds. 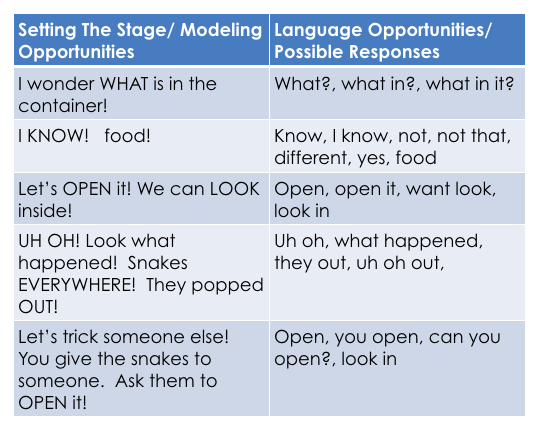 Some comments/ adjectives we’ve practiced include “too loud, annoying, bad, like that, funny, silly, disgusting, weird, etc.” Some directions I’ve heard students give or that I’ve modeled include: “do it again, pick a different one, you try, I pick. The Magic 8 Ball is a good one to use when working on asking questions. Who knows what answer you’ll get! It might be helpful to have question starter visuals. Great to use with a group; let one student ask, another shake, and a third person read the answer! Some other fun ideas: The rubber chicken, gum/ pens that shock the person who touches them, voice changing machines, and prank kits.